Florida manatee, Trichechus manatus latirostris, a subspecies of the West Indian manatee, endangered. A series of manatees gathering near the warm springs during the bitter cold period of early January 2010. 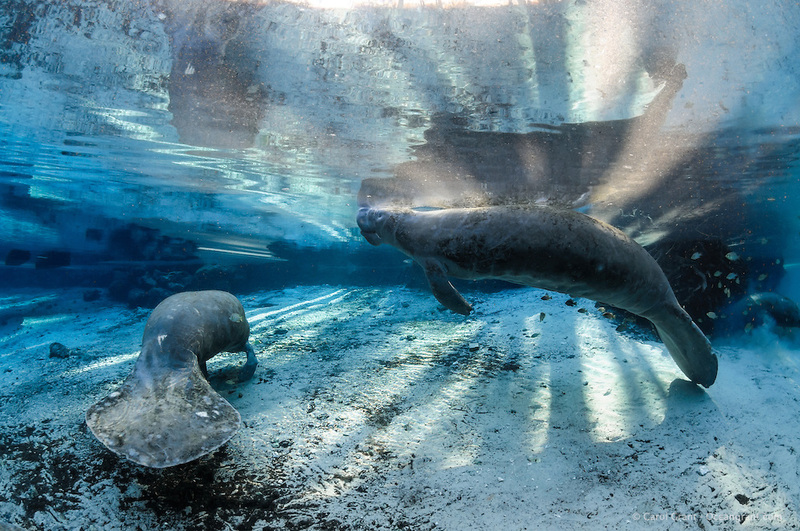 Two skinny adult manatees rest as one takes a breath in the warm shallow blue spring water lit by strong warming sun rays. Another manatee forages in the background surrounded by fish, bream, Lepomis spp. Manatees need these natural warm springs to survive cold weather, like today. Horizontal orientation with blue water and strong warming sun rays with reflection. Three Sisters Springs, Crystal River National Wildlife Refuge, Kings Bay, Crystal River, Citrus County, Florida USA.